CIP cleaning stands for ‘’cleaning in place’’ and are used extensively throughout thefood, dairy brewing and beverage industry. They clean equipment automatically to a high standard to ensure stringent hygiene regulations are maintained. Systems are designed to clean 100% of the machines interior by removing food solids and bacteria. Typically a CIP system would include a solution reservoir, a supply pump and a return circuit in the case of a tank or other similar vessel, a spray device and some type of return pump may also be included. Cleaning solution that is sprayed into a vessel and directed through associated pipework and then flushed to drain wouldn’t be considered CIP, as there is no recirculation established. CIP systems typically start with a pre-rinse to remove solids, followed by a chemical wash which is generally caustic based solution, and finish with a rinse using sterilising solution to remove the wash chemicals. 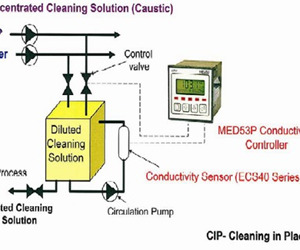 CIP systems offer fast, efficient and reliable cleaning of all types of process plant. Any closed vessel (tanker, tank, vat, chamber, hopper or bin) may be thoroughly cleaned using spray balls or rotating jet devices and this avoids the unnecessary and uneconomical filling of vessels with solution. It also removes the need for operators to climb into vessels to carry out manual scrubbing. 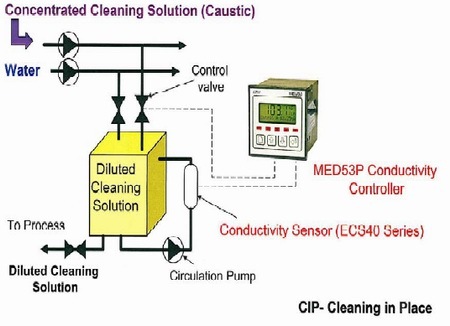 The following is a typical procedure used when cleaning food processing equipment. The factors that influence cleaning (time, temperature, chemical concentration and mechanical force) and the food soils to be removed will ultimately determine the cleaning procedures selected for use. 1) Pre-Rinse: Soiled equipment surfaces are rinsed with warm water to remove the loose food soils and pre-heat the stainless steel pipework. 2) Cleaning Cycle: Removal of residual food soils from equipment surfaces through manipulation of the four basic factors (above) and the method of cleaning. Typically alkaline chemical solutions are used for the cleaning cycle. 3) Rinse: Rinsing of all surfaces with cold to hot water, depending on the temperature of the cleaning cycle, to thoroughly remove all remaining chemical solution and food soils residues. 4) Acid Rinse: A mild acid rinse may be used to neutralise any alkaline residues that remain. 5) Sanitise: All equipment surfaces are rinsed or flooded with a sanitising agent. CIP systems include a recovered water tank where used water from final rinses is stored for subsequent use as a pre-rinse. If a disinfectant/sanitise cycle is used then this solution can be recovered and reused for pre-rinse purposes. Generally two types of cleaning products are used; an alkali cleaner which is essentially sodium hydroxide (NaOH), or an acid cleaner which is based on phosphoric acid. The cleaning solution is usually heated to 85°C. The concentrated chemical(s) are held in bulk storage tanks and transferred to dilution tanks where they are made up to the required concentration for cleaning, usually between 1-5% vol/vol. Conductivity measurement is ideal for this application as only one substance is present at a time. The conductivity sensor is usually mounted in the circulation loop coming from the base of the tank and the pumped back into the top. This also provides the agitation needed to mix the chemical and water together. Mounted in the circulation is also the heat exchanger to bring the dilution up to the specified temperature. The CIP make up tank will run continuously to ensure the cleaning process is ready at any time during the day. Depending on production requirements this can mean that 6 to 8 process cleans are carried out per day. A centralised control system usually supervises the cleaning process which involves pumping the product and cleaning chemicals around the pipework and tanks in the system. The product, such as milk or beer is pushed through the system with heated clean water, followed by the cleaning solution, then water and usually followed by a sanitising solution, then one final rinse before the product. Each of the different solutions has a very different conductivity value so it is possible to detect the interface between each of them when they pass a conductivity sensor. Each can then be diverted via an automatic valve to a bulk storage tank or to drain as required. Due to the need to keep the inside of the pipework clean and for the automatic cleaning process to have maximum effect, it is essential that crevices (screw threads etc) are eliminated. This is achieved by using hygienic or sanitary fittings. There are several standard, the most common being Din, Tri-clamp, IDF, and RJT. Any sensor which comes into contact with the product will require this type of connection. In the past conventional conductivity (Contact version) would have been used for the measurement of conductivity in a CIP application, but with the introduction of electrodeless conductivity (Inductive) this is now the preferred method. The electrodeless method has been developed to overcome the greatest problem with the contact method which is electrode blinding or fouling. Any coating on the electrode surface impedes the current flow and will give a low reading. By inducing a current into the solution this problem is eradicated.